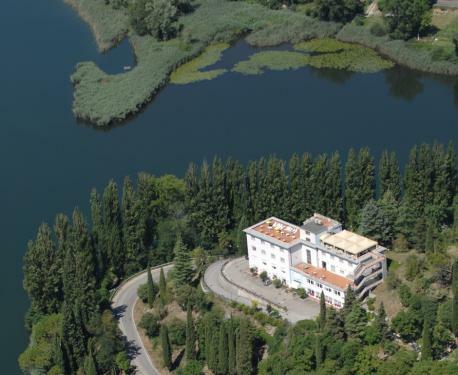 Hotel del Lago Piediluco, in Umbria, the green heart of Italy, sits between a rocky outcropand luxurious vegetation in panoramic dominion of the ancient borgo of Piediluco and theenchanting lake. Water from the lake reaches in 4 kms, belong the Velino River, the mostimportant (Marmore) waterfalls in Europe. The hotel provides 46 rooms with airconditioning and private bathroom. It represents a true oasis of tranquillity, with itshospitable and refined atmosphere. 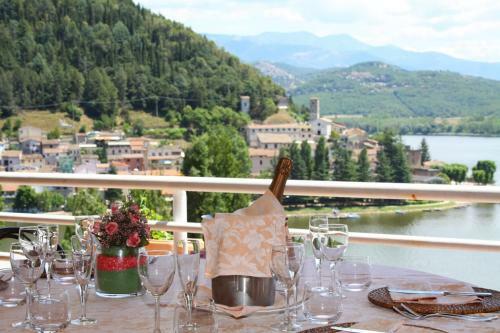 It has convenient and free parking available forguests, a small natural park that surrounds it, a bar, a convention center, two restaurants,summer solarium and Belvedere Terrace where breakfast is served in summertime andwhere you may have lunch or dinner a la carte.